One of the best things about travel, especially off-the-grid travel, is disconnecting from everything. That said, when you’re lost, injured, or in the process of being eaten by a bear, being able to get in touch with the other members of your party is a welcome option to have. That’s where goTenna Mesh comes in. 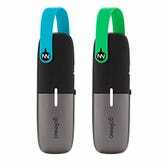 goTenna Mesh let’s you send (encrypted) messages (with delivery confirmation), or GPS locations without the use of cell phone towers or Wifi networks. The accompanying app also features downloadable detailed offline maps with shareable pins. Messaging works for groups of up to 10, with both one-on-one and group chats supported. goTenna Mesh, the company’s newer product, uses other goTenna Mesh units (not just the ones your party brought) as relays to further extend your network. You can strategically place Mesh units around for greater coverage, or be the altruist and leave your Mesh on as a relay to help out others. goTenna Mesh isn’t just for the wild. Bring a few along to one of those weird festivals with no cell service the kids are going to these days, on a cruise where the cost of Wifi can be astronomical, or abroad to countries your cell phone provider doesn’t offer a reasonable rate in.